In the Fudoki, Kaka-ura is listed in the Shimane-gun section thus, ' Kawakudono Ohama, dwellers present.' The area has a large beach, 500m wide. Regarding the reading of the two characters for this bay name as written in the Fudoki: If we approach this without any background information, we would ordinarily pronounce the characters as 'Ka ka'. However, the name was altered slightly in 726 to two characters that are generally read as 'Ka Ga'. This suggests that the original pronunciation was, indeed 'Ka Ga'. Today, however, people tend to strictly adhere to pronouncing it as 'Ka ka' suggesting they place more importance on standard linguistic rules as opposed to the historical background behind the naming of local areas. 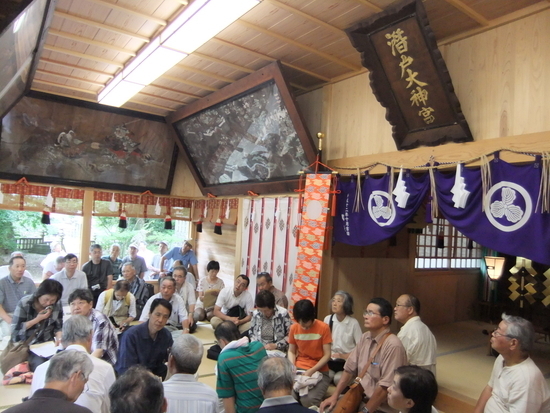 The dwellers mentioned in the Fudoki no doubt had their own religious faiths, but the Kaka-yashiro (shrine) mentioned is surely the 'Kaka-jinja' listed as part of the Engishiki (official religious listings.) The enshrined deity, Kisakahi hime, is the mother of the deity of Sada-jinja, Sada Ookami, whose birth is a very well-known part of Izumo mythology. This Kisakahi hime is the same 'Kisagahi hime' that appears in the Kojiki as the savior of Ookuninushi. She is the goddess of shellfish. Currently the shrine is located near the Shimane Elementary school in Aza Mukaida, but it's likely in ancient times it was enshrined within the Kukedo cave itself. With this awareness, we can see reference to it upon entering the western cave in the white wood torii gate on the left hand side wall. It may well be reminiscent of the scene from the ancient days of old Kisakahi hime. A plaque inside is inscribed with the 18th century name used for the shrine, 'Kukedo Daimyogu'. The sister kami Umugaihime no mikoto is enshrined in Hakki jinja in the south. This Kakakukedo mythology written in the Unyoushi, was strongly influenced by the older historical records "Nihonshoki" and "Kojiki", noticeable by its references to Izanagi, Izanami and Amaterasu as the deities. Now, preferences have swayed back to the time of the Fudoki and Kisakahi hime has been reinstated as the main deity with the other three kami making up her entourage. It would appear these changes are keeping up with the changes to the deity at Sada jinja. Kaka shrine is located on the left as you look at the Sports Hall/Shimane Community Center (Library) just after going past the Kaka Pleasure boat depot port, 'Marine Plaza'. The Prayer Hall houses 8 giant (2x1m) emotive tablets (Ema) depicted scenes such as The Genpei War (1180-1185) and the Maebune cargo ships used during the Edo Period. One feels the depth of not only faith, but history too when visiting here. It's strongly recommended to organize a trip on the Pleasure Boat at the nearby Shimane Community Center. Kukedo consists of two caves. The one on the oceanside is known as the 'new Kukedo' which opens up into the 'old Kukedo'. The caves can be visited between March and November from Marine Plaza, the whole journey takes around 50 minutes but such a departure along the outer waters are very much dependent on weather conditions. It is therefore advisable to check with the pleasure cruise office on the day to ensure the tours to such remote locations are being run on the day. 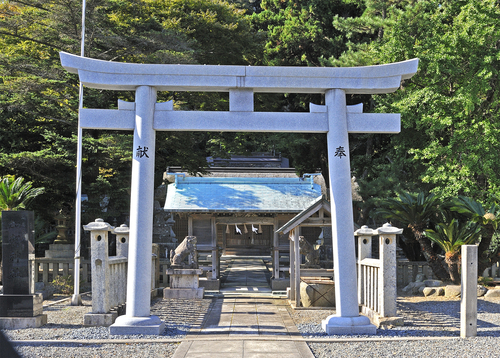 The Izumo-no Kuni- Fudoki states that Kukedo is the birthplace of the enshrined deity of Sate-jinja, Sada-no-Ookami, born of Kisakahime-no-mikoto. The old Kukedo contains 'Sainokawara', a selection of statues dedicated to deceased children, the presence of the 'Jizo' deities make this a good place of worship.